This summer my wife and I experienced a dream I have long had – all summer off the coast of France in a magnificent yacht. 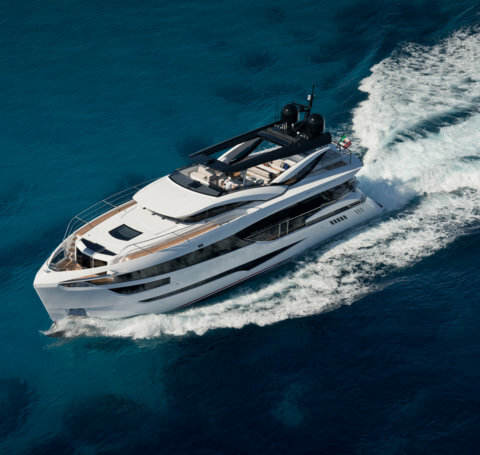 Dominator 28M Ilumen performance and special feel of comfort and elegance was spectacular. We could not have been more pleased. 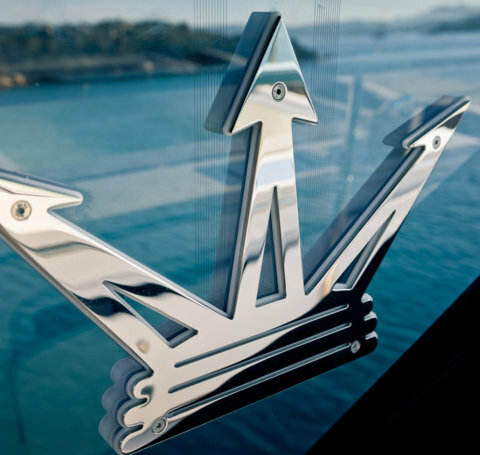 Design is more important than ever, and today owners want a yacht that offers the ultimate blend of performance, style, luxury amenities and comfort. In satisfying the demand for an elegant motor yacht that harmonises classic yachting tradition with modern technology and design, we designed the Dominator Ilumen to far exceed our clients’ expectations. How many motor yachts of this size consistently integrate mega yacht solutions the same the Ilumen does? None! From the high-tech construction in post-cured glass and carbon mixed with epoxy resin to the full use of epoxy filler cycle and the application of the Awlcraft painting cycle instead of common, cheap gel coats – every detail immediately tells you that Ilumen is something quite different. 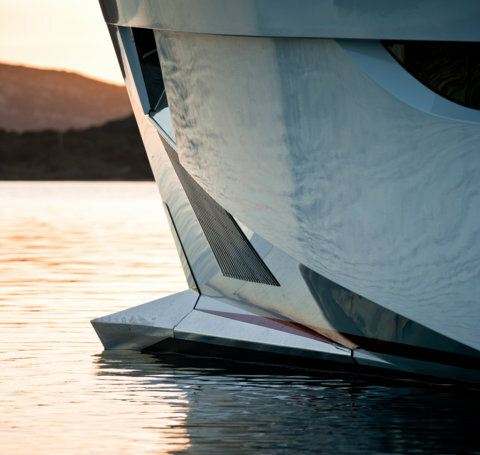 Our commitment to technological research and development, coupled with the finest designers and master craftsmen, ensures that a Dominator yacht is indeed a unique masterpiece. 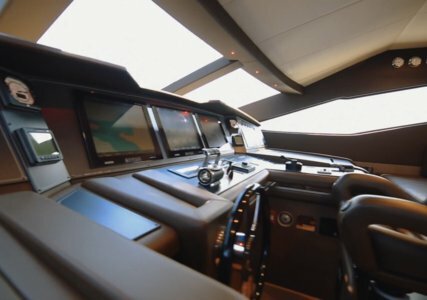 This drive for perfection is what our reputation is built on, and as a family-run company with full direct connection with the business we treasure that reputation and the relationship with our yacht owners who are not seen as clients so much as members of a very special Dominator community. 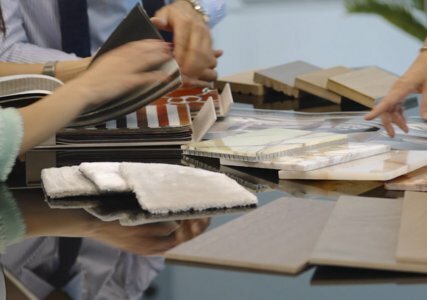 This personal relationship and dedication to creating a unique, bespoke product for each owner means we are not only flexible, open-minded and transparent, but also available to you 24 hours a day. From the quality of the materials used to the functionality of design and layout, and the advanced engineering solutions we painstakingly seek, Dominator sets new standards in power, comfort, reliability, ease of maintenance, cost-effective efficiency and safety. This is possible not just because we work with the best designers and engineers in the field, both within the company and in alliances with others respected firms and technical institutions, but above all because we don’t take the easy option but continue to invest in the best and most advanced solutions, whether they are visible or only known to industry experts. 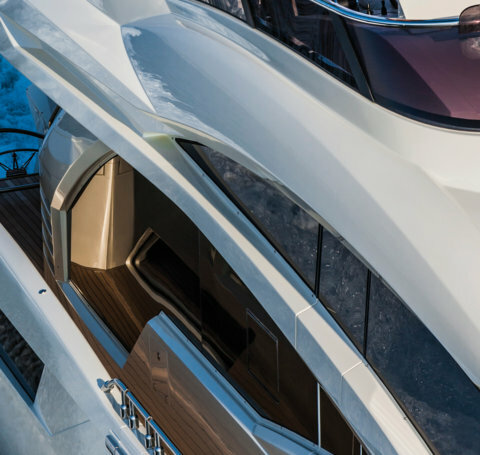 The finest quality materials are handpicked in both the construction and dressing of every Dominator, ensuring that each yacht that leaves our shipyard is durable, beautiful and designed just for you. All Dominator yachts are delivered to RINA CE category A+ norms as standard. 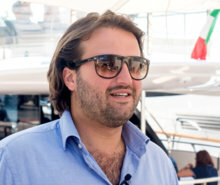 They are therefore certified to the highest standards of yacht design, construction and commissioning. The Ilumen 28M and upwards can also be provided with commercial registration. 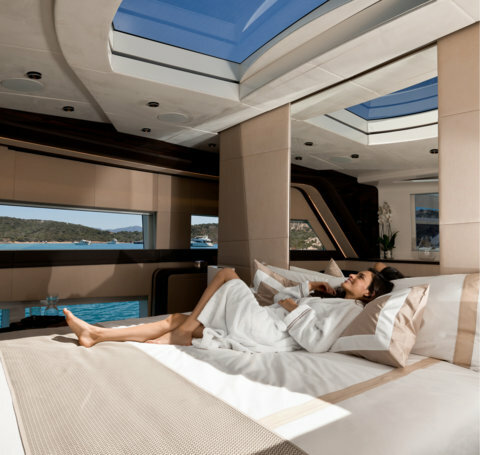 Forget hot, noisy and oily engine rooms, such a thing does not fit aboard a Dominator yacht. 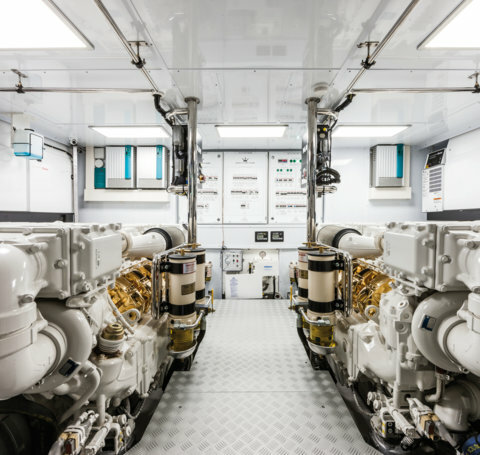 Though you may not spend much time in the engine room each one is immaculate and easy to get to, with the Ilumen range including a control room as seen only in mega yachts. Dominator yachts are always built to the most exacting standards, using the so-called Sandwich Method where fibreglass is overlaid on both the inner and outer surfaces to create a rigid ‘sandwich’ structure that is far stronger and lighter than a conventional single-wall fibreglass shell. Traditionally shipyards use Vinylester and a Gelcoat or even just Polyester, which produce unhealthy vapours over time. Rather than save on quality and safety, we use the most expensive resin, Epoxy – the best in terms of strength and lack of emissions. 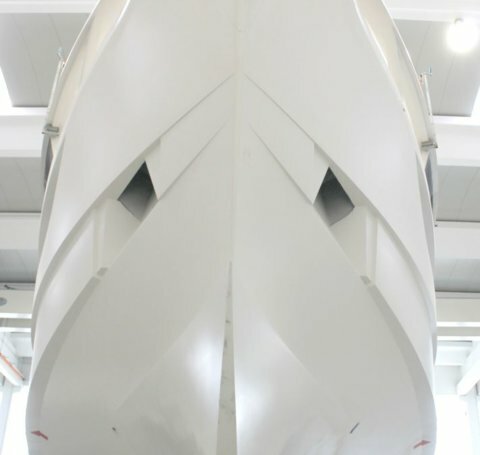 We use industry-leading techniques to create a Dominator yacht, with fibreglass that is bundled and stitched rather than woven, so there is no crimp in the yarn. We use full carbon fibre stringers in the hull and Ilumen superstructure for phenomenal strength and lightweight mobility. 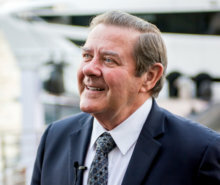 The close collaboration between our engineering department and the various handpicked suppliers has led to unparalleled stabilising systems that use a combination of Gyros, Interceptors and Fins together with leading edge hull design to produce unsurpassed performance and comfort at sea. The highest-grade materials are employed to ensure the utmost standards of comfort aboard. This is made possible by detailed measures such as special engine room insulation with D-Bond and perforated tiles, as well as advanced thermal and sound damping insulation with Mascoat. 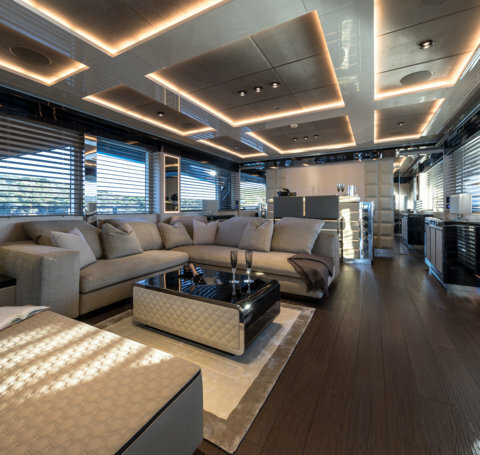 The beautiful synergy developed between Boutsen Design and Dominator in adding the final touch of decoration enhances the splendour of the refine interior and exterior of their luxury yachts with a strong emphasis on personalisation and uniqueness. We are proud to fit our advanced MAN V8-1200 engines amongst others to the beautiful and innovative, semi-displacement Dominator Ilumen yachts. The close collaboration between Dominator, Reintjes and CJR engineers has led to an unparalleled propulsion solution where the hulls, the rudders, the propellers and the propulsion systems are perfectly matched. 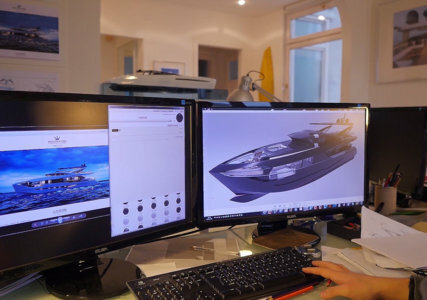 The Opacmare custom-solutions department works closely with Dominator engineers to create bespoke solutions that are technologically advanced, effective and pleasing to the eye. Dominator works together with the world leader in active gyro stabiliser technology to achieve perfect seakeeping performances for the Dominator yachts. To enhance comfort on board when at speed Dominator relies upon an advanced full motion damping system capable of significant roll and pitch reduction called Humphree Active Ride Control. The top range leader in innovative audio-video, communication, entertainment and home automation systems is proud to have developed bespoke systems for the innovative Dominator Ilumen range.